The Mayan civilization of Mesoamerica is known for many things including a hierarchal and structured society, warring ambitions, human sacrifice, abandoned cities overgrown by jungle, monumental pyramids and an astute knowledge of the heavens. 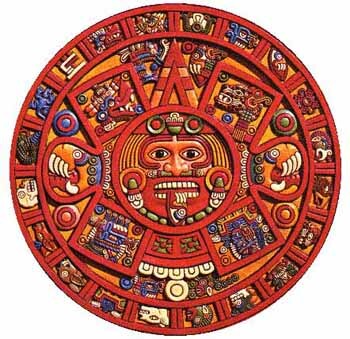 Mayan astrologer-astronomers could predict solar eclipses and named the stars. 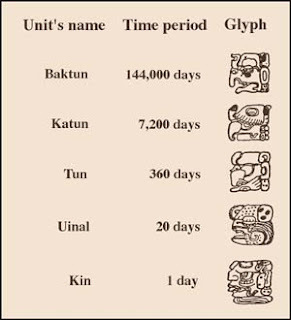 The Mayans kept time with the use of three different dating systems that worked in parallel: the Haab or 'civil calendar' consisted of 18 months each of 20 days with 5 'extra' days added at the end of the year to make 365days in all (they were aware that the true length of the year required an additional 1/4 day each year but it is unclear how they compensated for this within their system); the Tzokin or 'divine calendar' with a combination of 2 'week lengths': a numbered week consisting of 13 days and a named week consisting of 20 days;and the Long Count (astronomical?) calendar. 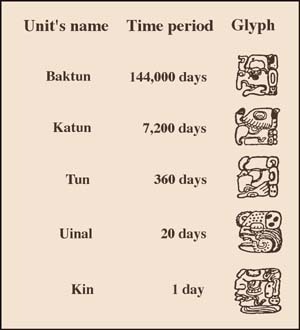 The Long Count calendar was divided into 5 units: one 'kin'=1 day; one 'uinal'=20 'kin'; one 'tun'= 18 'uinal'; one 'katun'= 20 'tun'; and one 'baktun'=20 'katun'. Each unit also had divisions and was numbered so as there were: 19 'kin'; 19 'uinals'; 19 'tuns'; 17 'katuns'; and 13 'baktuns'. the beginning of the world (or era?) or the day of creation. According to this Long Count system, creation took place in about the year 3114 BC (by our current system), and the end of the world will take place sometime between December 20 and 22, 2012. The Mayan calendar, however does 'renew' itself and continues with a new count beginning after our December date of 2012. Does the end of this Mayan Long Count really signify the end of the world or simply the beginning of a 'new age'? Archaeologists working at the Xultun ruins of the Mayan civilisation have recently (May 2012) reported striking finds, including the oldest-known Mayan astronomical tables. 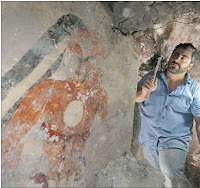 This site, in Guatemala, includes the first known instance of Mayan art painted on the walls of a dwelling. Researchers believe that the one of the rooms building was used as a writing room, and made up part of a complex associated with the work being done by Maya scribes. 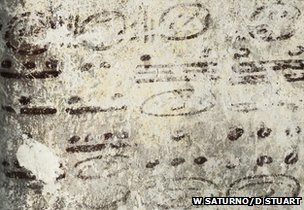 Several finds related to astronomical tables, including four long numbers on the east wall that represent a cycle lasting up to 2.5 million days. The east wall was covered by tabulations of black symbols or glyphs' (see post: Glyphs) which map out various astronomical cycles: that of Mars and Venus and the lunar eclipses. This Xultun find is the first place that all of the cycles have been found tied mathematically together in one place, representing a calendar that stretches more than 7,000 years into the future. Perhaps by coincidence, astronomical predictions show that, for the first time in 26,000 years, our sun will align with the center of our galaxy (the Milky Way) between December 20 and December 22, 2012. How did the Maya know this? Does this mean anything? Some predict that this alignment will cause catastrophic changes on our planet. ...'You have been warned. '...But that may be the subject for another post. *Mayan religion and the apocalypse: subject of research for the novel The Tao of the Thirteenth God - Amazon Kindle.